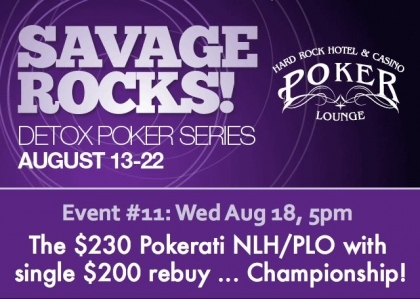 Tomorrow is the second guarantee @DetoxPoker … $50k assured, for a $230 buy-in with a single $200 rebuy. That makes the math pretty hard to do for how many runnin’ rebuyers they need to avoid putting up an overlay … and potentially having one of the new suits chopping heads from the Poker Lounge staff willy-nilly. But gotta think they’ll make that small one. Of course the real event everyone’s talking I’m thinkin’ about is tomorrow’s big Pokerati event at 5 pm. While there’s no guarantee in play beyond good times, lots of action, and a little PLO tourney experience — and its still unclear how CardPlayer intends to interpret their own rules for POY points — Event #11 is the one tournament at Detox offering a true World Championship. I know this because I declared it so myself … and I’m pretty sure that’s how it works in poker! So as of right now, until someone declares otherwise, tomorrow’s late Detox event will be the 2010 Pokerati NLH/PLO Championshi … check that … make it the 2010 NLH/PLO World Championship! For the past two months, Phil Ivey, Durr, Gus Hansen, Patrik Antonius and the online phenom/enigma known as Isildur1 have been playing some of the most outrageous poker we’ve ever seen at what can only be described as nosebleed-level stakes. The question is, with millions of dollars being shifted around each session – or hand, as the case may be – how much longer can they keep these remarkable games going without any fresh fish at the table? Our friend Bill Rini thinks the answer is not much longer. For those who forgot to tune in Wednesday night for the debut of “Poker 2Nite” onFSN, or it didn’t air in your area, the show featuring Scott Huff, Joe Sebok, Lacey Jones and Dana Workman is now available online. Part 1 is embedded below, followed by parts 2 and 3 on the next page. 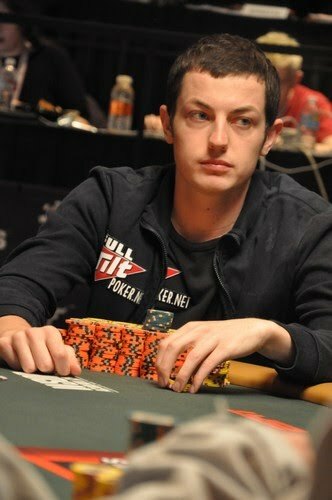 In a press release dated for Monday, Full Tilt Poker announces the signing of their youngest member to Team Full Tilt, Tom “Durrr” Dwan. Chances of an awkward press conference like the one held for Patrik Antonius? Four players remain in the $2,500 Omaha 8/Stud 8 event, with Phil Ivey the current chip leader with over 1.1 million in chips. Ming Le, Carlos Mortensen, and Dutch Boyd round out the remaining players. 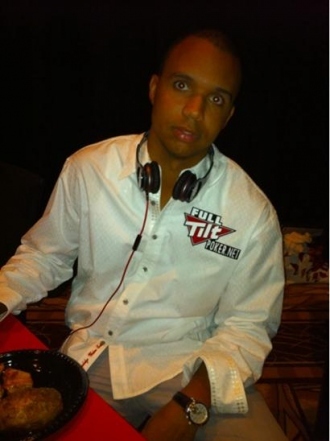 Remarkably, Ivey is still in the field in the $5,000 PLO 8 or Better event with 23 players remaining, 18 make the money. He’s played very few hands in this event, but the ones he has played have given him a medium sized stack. The current chip leader is Anthony Lellouche with 357,000 in chips. Other notables include: Brett Richey (250,000), Scott Clements (155,000), Jeff Lisandro (124,000), and Ivey (92,000). The final table of the $1,500 NL Holdem event now has six players remaining with Glenn McCaffrey the current chip leader with 2.64m in chips. Michael Greco battled back from a short stack to take second with 2m in chips, followed by Andy “BKiCe” Seth, “Pete the Greek” Vilandos, Dean Hamrick and Alan Jaffray, and round out the field. The $1,500 Limit Holdem event is now down to 44 players with Glenn Englebert the leader with 144,000. Notables remaining include Rep Porter, Paul Darden, Noah Boeken, Justin Bonomo and Phil Tom. The $1,500 NL Holdem donkament field has returned from their dinner break with 846 players remaining from a field of 2,641. Jason Potter is the unofficial chip leader at 28,000 and a cast of hundreds following behind him. Four more levels of play remain, unless they’re near the money and extend play for a few extra minutes. The $10,000 Heads-Up NL Holdem World Championship has concluded round 1, with the 2nd round starting at 10pm PT. Notables returning at that time include David Benefield, Dustin “Neverwin” Woolf, Tom Dwan, Greg Raymer, Brock Parker, and Chris Ferguson. Phil Hellmuth, Nam Le, Gus Hansen, Erick Lindgren, Vivek Rajkumar and Howard Lederer weren’t as lucky, as they were early eliminations. 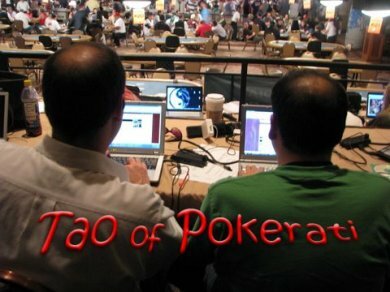 A few more hours remain on Saturday, so check out www.wsop.com and Pokerati for more stuff. A german fan! I won’t waste your time with the rest of the press release, but it did make me lol while shaking my head, because I had no idea who Nicole Sullivan was … yet it does deserve more ink that Mike Sexton faux challenge to Paris Hilton that may or may not have something to do with charity … But in this case … Nicole Sullivan … we’re talking the girl who played Holly the dog walker on King of Queens. Nicole currently stars as Rita Clemens on Lifetime TVâ€™s original sitcom Rita Rocks as an overworked wife and mother who forms a garage band in the middle of a full-blown identity crisis. You can’t make this stuff up! Reminds me of the Chicken of the Sea ads on Celebrity Apprentice. And really, it’s hard to poo-poo any efforts to bring more wine-drinky moms into poker. Sorry for the slacking off on posting these GSN episodes from Youtube, but I’ve been busy with stuff. This week’s episode is the last of the day 2 lineup, as some new faces will join the established players seen on the first 10 episodes finish the season 5 run.